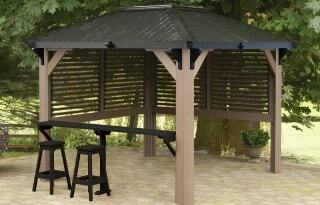 Semi-enclosed gazebos offer something in the middle. The Tuscany pictured here is your complete backyard enclosure that suits your larger spa, or allows for more sitting room while cooling off. 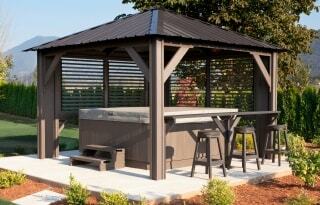 The adjustable louver panels put you in control of your privacy and exposure to the outside elements. Three stools and the bar kit let more people join the fun. 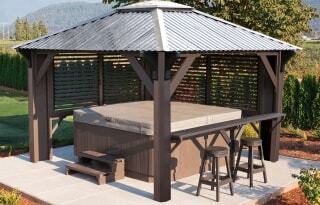 Visit one of our showrooms to see in person the beauty, quality and durability of our floor model gazebo. The Tuscany is your complete backyard enclosure that suits your larger spa, or allows for more sitting room while cooling off. 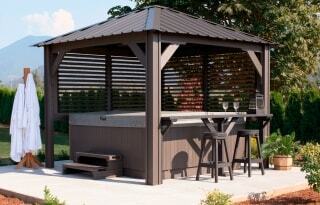 The adjustable louver panels put you in control of your privacy and exposure to the outside elements. Three stools and the bar kit let more people join the fun. The Mt. Alta by Visscher turns your spa into your exclusive entertainment centre. This model incorporates a 42″ x 42″ skylight dome in a trusted Visscher roof structure. Sturdy posts and bar accent your property nicely. 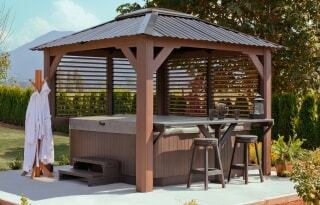 Adjust the louvers to suit your level of exposure to the elements as you relax beneath this structure.